I am so excited to finally be starting my New York Fashion Week recap posts! I had lofty ambitions of starting these last Monday, but with the chaos of Fashion Week while I was there and being sick since I’ve been home, that clearly didn’t happen. So, over the next two weeks I’ll be sharing six New York Fashion Week recap posts, (one for each day I was there). For each post, I’ll review each of the designer’s shows that I saw that day; making sure you have the scoop about spring/summer 2019 trends. Then, I’ll share what events, meetings, or parties I had. Let’s get started! My first day of New York Fashion Week this year was Thursday September 6th. After a red-eye flight into JFK I was exhausted, but so ready to hit the ground running. I only had one show today and it was one of my favorite’s from the entire week- Pamella Roland. The Pamella Roland runway show truly took my breath away. The attention to detail – be it sequins or buttons (see the yellow suit below) – was incredible. I also loved the rich colors and 80’s inspired feel of some of the pieces (note the bold sleeves and shoulders). I also really loved the dramatic off the shoulder V cut neckline present on so many of her dresses. Again, this gave me all the 80’s feels. The centre dress below is probably my favorite of her dresses this season. 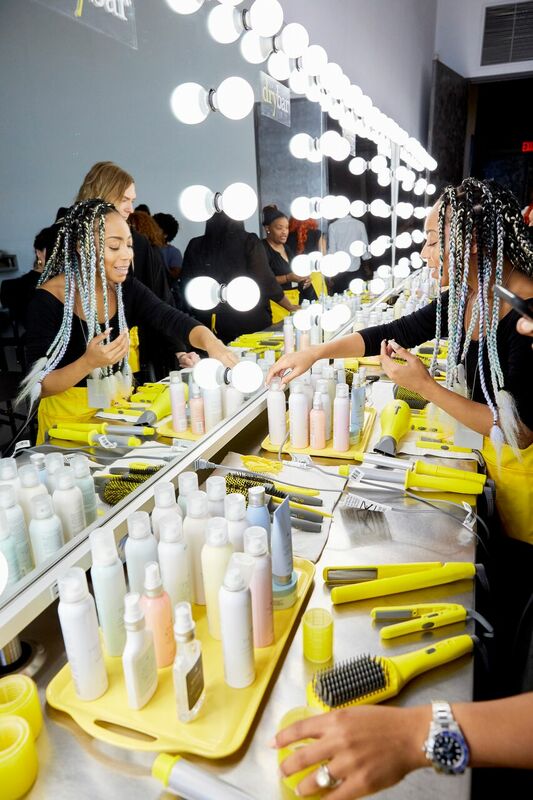 I was lucky enough to go backstage for Pamella Roland, thanks to Drybar who was in charge of the hair for the show. The look for the models for this show was very straight, sleek hair and very light, highlighted makeup. It was soft and pretty. 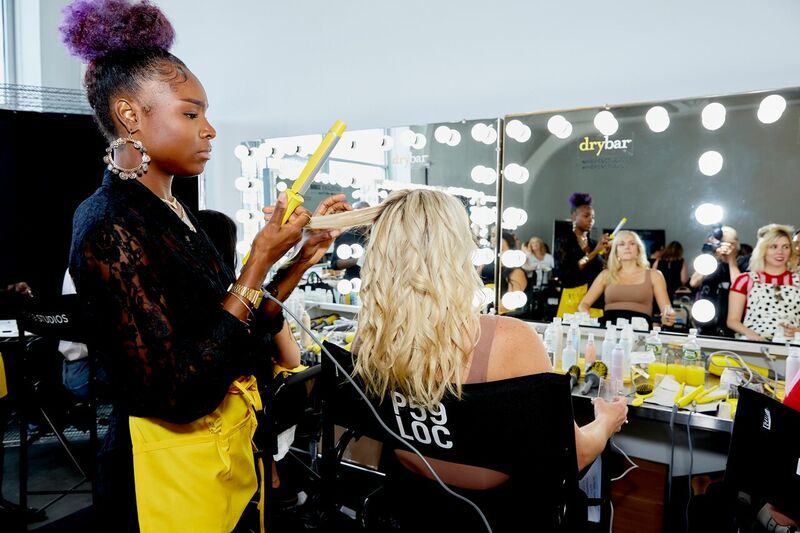 It was cool to see all the hair and makeup artists at work and, the best part, once the models were done the drybar girls did our (the influencers’ backstage) hair. We also got to meet Alli Webb, the founder of Drybar, who was so kind, so generous with her time and advice to women in business, and so gorgeous in a bright red Pamella Roland suit. No New York Fashion Week Recap would be complete without talking about events. Day One I had three events; a brunch with Alterre Shoes, a visit to the Joules showroom, and a party at Intermix in SoHo. Alterre was a brand I had not heard of before, but I am now a huge fan of their shoes. Alterre is designed in New York by two young women and the premise is that there are ‘base shoes’ that they make and then you choose between dozens of different straps and add-on’s to change the look of the shoes. It’s a great way to cut down on the number of pairs of shoes you have (without sacrificing options), and is also really great for travel. You can pack one pair of shoes with 4 or 5 different straps and have totally different looks for your outfits! The layout for the brunch was really cool – the latest collection of Alterre shoes is called “Flying Circus” and is inspired by the silliness of Monty Python’s “Silly Walks” sketch and the general whacky bold imagery of the 1960s. To that end, the room was decorated in fun colors with giant flowers, and colorful chairs. I had a blast checking out there incoming collection and trying on some fun pieces like this red raincoat and yellow rain hat that basically made me feel like a human Paddington bear. To wrap up my New York Fashion Week recap post, I’ll end of with my last event of the night- a party at designer clothing store Intermix. 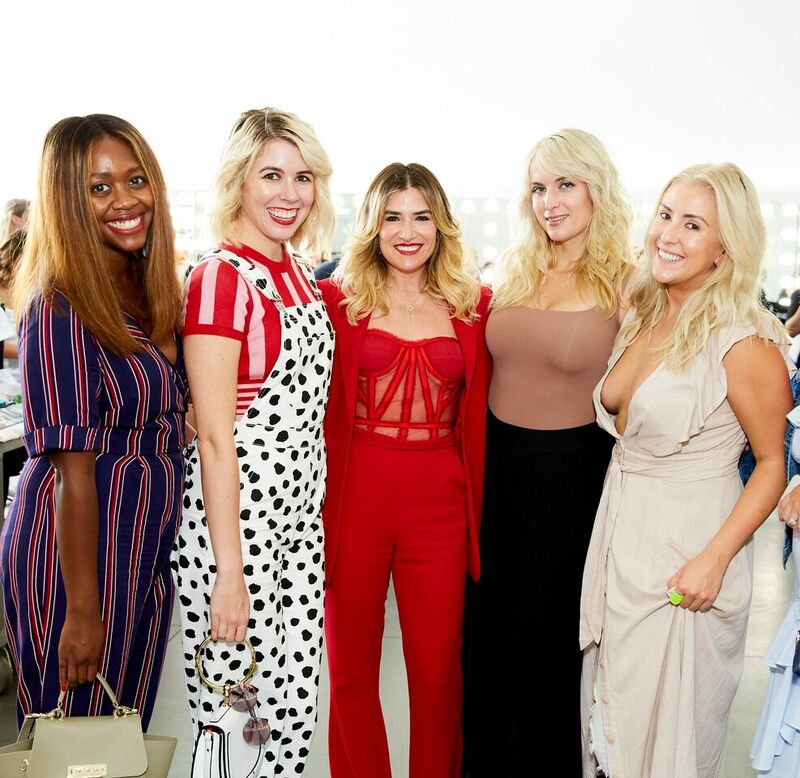 Intermix in SoHo opened up its doors to a number of us bloggers and influencers and had a party inside the store complete with a great DJ and open bar. It was great way to end day one! Stay tuned tomorrow for a recap of Day 2! Plus, I’ll be sharing the outfit I wore for day 2 shows – and it’s one of my favorite outfits to date! What an amazing opportunity and lovely dresses. Aw thank YOU so much for reading! So glad you liked the post. Day two is up now!! It really was such an awesome collection! I definitely want to invest in one of her dresses now. … Now to choose which one! 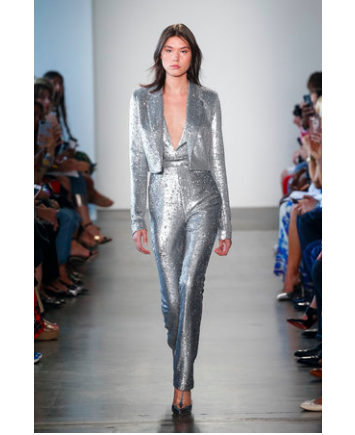 Thanks so much for reading; i’m glad you are enjoying the NYFW posts!